Six years ago, when I started my studies in Acupuncture, I also began to study Qi Gong and Ba Gu Zhang. For this reason, my understanding and practice of Chinese medicine has an important visceral aspect. One’s understanding of the movement of Qi Gong happens over time and is exponential. Typically, a beginner must practice daily for three or four months to experience the first profound change in their movement. This change broadens the awareness of the mind in terms of movement potential and, ultimately, provides an understanding of primary principles that are shared by all learned disciplines. Gong Fu refers to any study, learning, or practice that requires patience, energy, and time to complete. Most of us are familiar with this idea through martial arts but it is equally true for all pursuits of skill and ability. Musicians, athletes, writers, painters, woodworkers, and many others only become skilled and successful by practicing their art patiently, with diligence and inspiration provided by each new discovery of greater ability achieved through practice. The process is cyclical in nature. The cyclical process of human learning and understanding is reflected in the design of the body. Understanding Qi Gong movement, with the help of understanding basic anatomy, shows us that the human body is built to function in spirals and on many planes at once. Similarly, trauma enters the body in spirals and affects the body in many different layers. Having a visceral understanding of the way the body moves greatly informs the process of healing, from the standpoint of the practitioner and, just as importantly, from that of the patient. In my acupuncture practice, Qi Gong is the cornerstone of my ability to perform Tui Na effectively. It also serves as physical therapy exercises given to patients to address specific injuries or imbalances of movement. The level of success I achieve with my patients is directly related to whether they choose to do the exercises or not. Further, those patients that embrace the philosophy of Qi Gong gain longevity in their recovery, ultimately learn to treat themselves effectively for the minor injuries that we all incur throughout every day life. What is interesting about this case study is the way this particular body (mine), trained intensively over the last few years to investigate, explore and articulate the natural spirals of the body, responded to a life threatening accident. And what may be gleaned from this experience is the effectiveness of Qi Gong for the practitioner and patient of Chinese Medicine. The evening was Father’s Day, 2012. We were celebrating in a beautiful house by the sea. After dinner a group of 8 or 10 spilled out onto the deck that wrapped the entire house about its second floor. I was casually (and perhaps stupidly) leaning against the railing of the deck, chatting with my brother-in-law about the possibility of acupuncture helping his low back pain. Without warning, the entire 6×4 foot section of fence-like banister gave way and I went crashing to the ground, 20 feet below. The ground was grass and I had drunk a bit of wine, both aspects that were lucky. I wish I could say I sensed the fall and used my martial arts training to execute some kind of high-wire break fall. But the truth is that one moment I was leaning on the rail and the next I was coming to from being unconscious for 20 or 30 seconds. The first thing I saw was my wife, terrified and almost hysterical, leaning over me and trying to figure out how badly I was hurt. I closed my eyes and looked inside my body. Incredibly, I sensed that my spine was whole and unbroken. To prove it to myself I stood up. This was met by a resounding call from the crowd to lie down and be still. What followed was a three or four hour process of being strapped to a board and carted off to a local hospital for x-rays and a brain scan. In the style of Chinese medicine I practice we believe that the sooner one can return an injured area to proper and natural range of motion, the better. So, after being cleared of any brain trauma, breaks, or serious tears to the musculature I began to try and move my arm as best I could. The hospital staff repeatedly and with increasing annoyance told me to stop moving my arm. When I was finally released I was offered painkillers and good luck. We returned to the house where my wife helped me needle my left shoulder and then I collapsed into a dreamless sleep. When I awoke I could barely move. I couldn’t turn my head, couldn’t move my left arm, couldn’t sit up, and I hurt everywhere. June 18h – After the fall and getting through the early morning, I returned to NYC and consulted my mentor, Tom Bisio. That evening, with the help of my wife, we cupped and bled my left scapula and upper back, and needled the opposite side SJ3 and BL63. I also took a Die Da Wan (“hit pill”). June 19th – Tom treated me with Tui Na, Acupuncture and Craniosacral Therapy. He threaded needles under the scapula and also threaded needles along the outer Huatuo Jia Ji line in the upper back (where the rib heads attach). Tom attempted to mobilize the fascia and spine with Tui Na techniques. I was in a lot of pain and my body was completely locked up, but he succeeded in “unwinding” the fascia and loosening things up. Tom’s cranial work calmed me down and helped me get back into my body a bit. He applied Guzengsheng Zhentong Gao Plasters and I took two more hit pills that day. June 20th – My assistant Thad Wong paid me a house call and treated me with Tui Na, a layered external liniment treatment (heating, cooling, pain relieving), and performed a cranial base (release of the junction of C1 an C2 with the occiput). 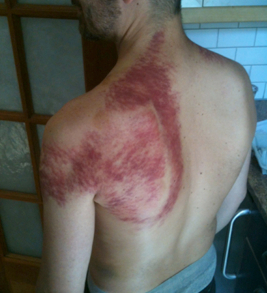 This treatment was very effective in releasing the superficial fascia and calming the nervous system. This evening I took my fourth and final “hit” pill. June 21th – I received Craniosacral Therapy by Leigh Murro, further releasing the superficial fascia, calming the nervous system and unwinding the twisted musculature of my shoulder, neck and back. June 22st – I “floated” (Sensory Deprivation Float at Blue Light Floatation). This is something I did years ago just for fun and relaxation but proved to be incredibly therapeutic during my recovery. The water of these tubs has a super high salt content so that you literally float on the surface like a cork. Taking gravity entirely off of my boney structure allowed me to gain space and literally decompress from the impact. The session is also completely dark and silent, affording deep relaxation of the mind. June 24rd – another Floatation session. Where the first was very soothing to my spirit and relaxing, this second session really blew me away in its ability to integrate the movement that Tom had achieved the day before and my own ability to get back inside my body. I literally felt my shoulder come loose and start to relax back into its proper alignment. June 27th – At the 5th Street Clinic, my other assistant, Ed Touhadian, performed Tui Na and Guasha to my shoulder (see picture below). Following this treatment, Tom mobilized some of my ribs and rotated my arm over my head for the first time since the fall. Once he did this, he encouraged me to continue to do it myself and I did. He also gave me herbs to clear blood stasis and dead blood, adding guide herbs to direct the formula to the shoulder and neck. This formula is below. June 28th – Practicing Qi Gong and the Ba Gua leg warm-ups caused a big fascial movement, which felt like the part of the lattisimus dorsi that converges with the inferior border of scapula “rolled” or “snapped” back into place. This was followed by considerable swelling. July 2nd – More Craniosacral Therapy by Leigh. My very limited ability to practice Qi Gong had now advanced to being able to practice Ba Gua Ding Shi, Tian Gan, and the Six Healing Sounds. July 5th – After a Ba Gua workout, Tom was able to mobilize the ribs directly under my left scapula and I could immediately breath more deeply. He also was able to partially mobilize my neck, although it remained pretty stiff and painful. July 12th – I received a full treatment at the 5th Street Clinic from Tom and the other assistants. They were able to perform a big decompression of my spine and Tom was able to mobilize C1/C2. Finally! My head felt like it was part of my body again. This treatment is detailed below. In retrospect, I believe I was very lucky. I also believe that my training conditioned my body to take the fall well. But what I know is that the constant practice of Qi Gong between all of the amazing treatments I received from my teacher and colleagues is what made the difference. It is what integrated the different treatments and continued the healing process. It is what continues it today, more than 5 months later, as pieces of the trauma are coming out of my wrist and ankle, injuries that were not even on my radar as I tried to get my shoulder to work again. This experience is a testament to the body’s ability to heal itself by gently being allowed to unwind and realign using the lengthening and rotational principles of Qi Gong. At end, I approached my recovery according to the philosophy that I have adopted studying Chinese Medicine under Tom Bisio and the Zheng Gu Tui Na curriculum. That is to say, the treatment strategy was to treat the body on many levels at once. Releasing the superficial fascia and addressing the emotional impact of the accident lead to therapeutic changes on the intermediate level, which in turn allowed the deep fascia and boney structure to be manipulated. All of it is interconnected and treating one level while ignoring the others yields limited results. Only by viewing the structure in its entirety can the practitioner be consistently successful and make substantial and lasting change.